Want to change your life? Give your teeth a makeover. Fix your teeth with one procedure: porcelain veneers. Fix multiple problems at one time. Get the perfect smile you’ve always wanted. Pick the best veneers for your teeth and budget. Porcelain veneers require a minimal amount of enamel to be removed from each tooth. 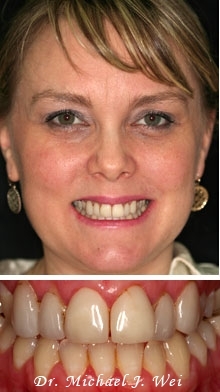 Prepless veneers involve little to no special prepping of teeth, just light sanding and cleaning. Cerinate Lumineers are the least-invasive way to upgrade your teeth and require little prep. They are all made of super-thin (like contact lenses), super-strong porcelain that blends with your natural tooth color to create a bright white, flawless, natural-looking smile. Yes, you CAN afford porcelain veneers. How many veneers you get. The material used to make your veneers. The dental lab used to create your veneers. The current condition of your teeth. No-interest financing from CareCredit or Lending Club make it possible to invest in your smile without destroying your budget. Take and post selfies you LOVE. No filters. Just flawless teeth. Veneers are the way to a celeb smile. Veneers are a powerful cosmetic dentistry treatment that will last for decades and make you look like a VIP. 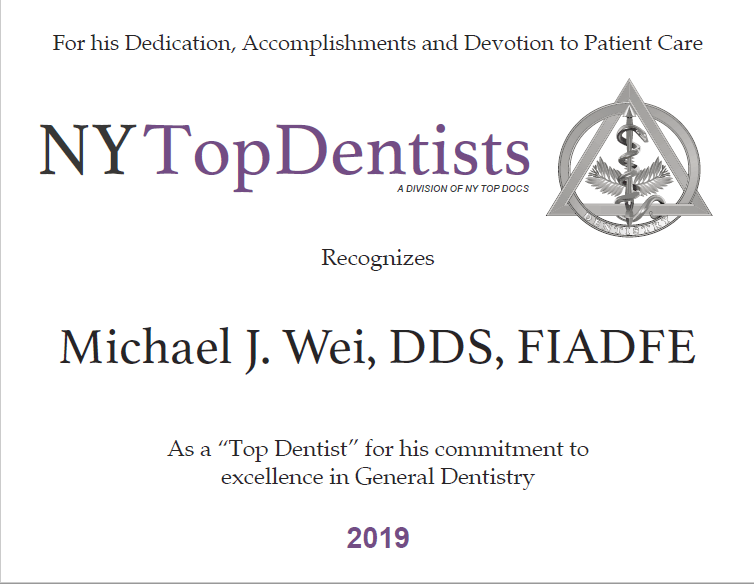 Make your appointment with Manhattan dentist Dr. Michael J. Wei at his Madison Avenue dental office to find out whether you are a good candidate for veneers. Change your life – now. First, Dr. Wei examines your teeth and considers your existing dentition and bite, as well as your skin tone, age, facial features, length of your teeth, tooth color, tooth shape, bone structure, face shape and facial symmetry. During your first visit, many times he will take impressions for a diagnostic wax-up. This is used as a blueprint for your final smile – something you can visualize. The next visit, the teeth are minimally prepared by removing a small portion of enamel about 0.3 mm – 0.5 mm to allow for the thickness of the veneers and to ensure a strong seal. An impression is then taken and prepared to send to the lab where the porcelain dental veneers will be created. 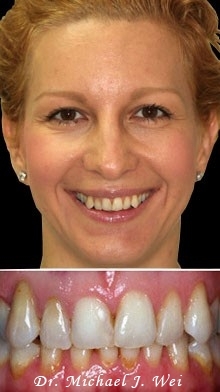 Then a trial smile (temporary veneers) will be made to give you a “test drive” of your new smile. 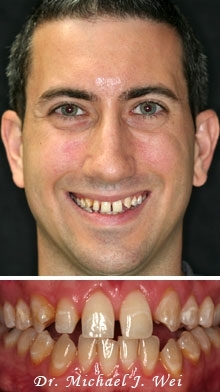 This unique step allows patients to test drive their new improved smile. 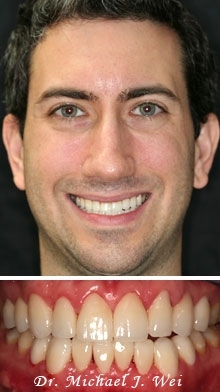 After wearing the temporary veneers, the patient returns a day or two later to provide feedback on the look, fit, shape, size, and color of their temp. Using this feedback and at this time, Dr. Wei can make changes to your smile before the permanent veneers are bonded to the teeth. Your new porcelain dental veneers are usually returned to our office within two weeks. 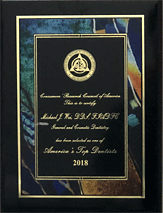 The last visit is when the temporary veneers are removed and the new porcelain veneers are temporary placed on the teeth to determine that they are the right size, shape, color, translucency, look and fit. Once your dentist and you have confirmed that the veneers are just right, they will be bonded to the front surface of each individual tooth with a tooth-colored resin cement. This is done by using a special curing light. Porcelain dental veneers provide a strong, safe, and durable solution to stained, cracked or crooked teeth. Dan wanted a brighter, whiter, gorgeous smile. He didn’t want to get braces to close all his spaces. He used to walk around embarrassed of his smile because of all the gaps between his teeth and the old dark stained discoloration . His new smile improved his overall self-confidence. Now he has the confidence he always wanted. He can smile easily and loves to show his new dazzling, brighter, and whiter smile. Tammy was concerned about the health of her teeth and old faulty, bulky, and misaligned porcelain veneers. Tammy’s old smile did not fit her vibrant personality. She always disliked the cracks on the old damaged porcelain veneers. She complained that the porcelain veneers didn’t look natural and vibrant. She wanted a more lively, natural, and whiter smile. We were able to give her the smile of her dreams. Her new smile improved her overall self-confidence. She said she did not realize how much her old smile had been holding her back. Now she gets compliments on her beautiful smile all the time! 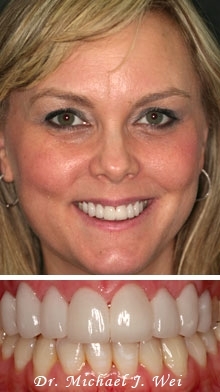 By using 8 Porcelain Veneers, we were able to give her a brighter and whiter smile to boost her confidence. She looks great and is very happy with a brand new smile. Discover the problems that can be fixed by porcelain veneers and if you are a good candidate for veneers. Tips on how to care for your new porcelain veneers. Avoid chewing inedible objects and staining liquids. Learn how to care for your new veneers so they last a long time. Find our the factors that effect the cost of porcelain veneers. 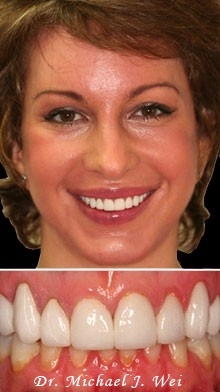 Prepless veneers require little to no special prepping of your teeth for the right candidates. Get answers to common questions about porcelain veneers. Get the latest news about porcelain veneers. Testimonials from actual porcelain veneer patients. Videos from satisfied porcelain veneer patients of Dr. Wei.